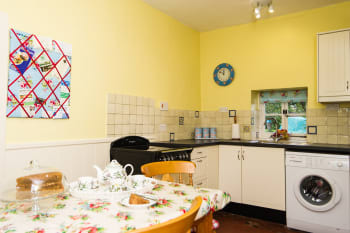 Our 5 STAR cottage offers Free WI-FI, 2 Bedrooms & 2 Bathrooms. 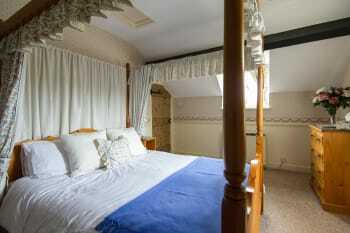 The bedrooms include a 4 poster King Size bed, and the second bedroom can be made up as a double or a twin bedded room. Both bedrooms have their own bathroom with bath & power shower over, wash basin and toilet. Downstairs there is a fully fitted kitchen with dining area and a sitting room with open fire. Linen, towels, electricity and fuel for the fire are all included. The cottage looks over a walled kitchen garden and grass fields to fruit orchards beyond and is in a very peaceful location, but with easy access to the M50 & A40 dual carriageway, Ross-on-Wye and Monmouth. There are no rooms available at Watchmaker's Cottage for these dates. The house was very comfortable and had everything we needed. Max and Jenni made us very welcome, were there if needed but totally respected our privacy. The old court house in Monmouth is a fascinating trip on a rainy day and a good museum there as well, Symonds Yat stunning even in the rain with calorie laden hot chocolate from the kiosk to follow, Goodrich Castle is amazing, as are the views from the Malvern Hills (The hotel next to the car park at British Camp does good food) excellent walks in Chase Woods near Ross on Wye and the best Italian meal ever in Avellino's in Ross on Wye. We loved the cottages and the area. The beds are cosy and clean. It was the 10nd year we came over for our holiday. And we will back for another holidays. De kids love to play in de garden. De sheeps in the fields are great. The red lion pub great food Seven seas in ross in wye great fish and chips and burgers. Hereford market and shop are nice Glouchester is great for shopping Abergavanny has a great market and butcher. Butterfly and amazing maze are great for the kids. Simons yat is really nice for walking. 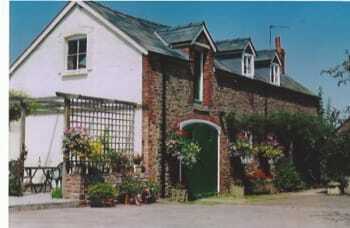 Carboots in Abergavanny, ledbury and a small town near hereford. Merry hill in dudley is a fantastic shoppingmall. And last but not least the gardens of david austin roses that fantastic. Thank you for this very kind review. We have indeed been welcoming you for 10 years and your parents for even longer and it is a great pleasure to welcome you back and see the children growing up. So pleased that you enjoy coming so much. WE wanted to explore castles and gardens in the Wye Valley and this cottage was ideal. We were met with scones and cream-which was indicative of the care that had been out into the cottage. 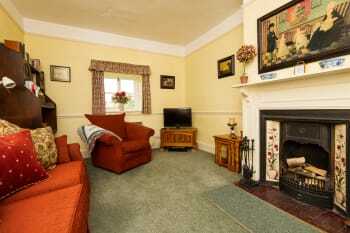 The cottage was set in the gardens of the owners homes which we were welcome to also enjoy. Having two bathrooms was great. Lovely welcome from Max and Jenny. Super cream tea what a treat after a long drive. We went out for lunches. Best lunch Bear at Crickhowell. Symonds Yat wonderful views of county in its best Spring clothes! Tintern so beautiful and the steep country lanes above it. Lanthonty Valley,very narrow road up to Hay on Wye with the ruined Abbey half way up. Hay on Wye very sleepy due to a very wet day. Lovely hosts ,and quaint cottage,well loved, but for families use to central heating, rather than storage heating it takes some getting use to.Lovely gardens , to use and admire. Lots of beautiful places to visit,Towns also. Great location, pretty cottage and welcoming hosts. Thoroughly enjoyed our stay. I won't spoil the surprise by saying more. Avellino's restaurant and the Mill Race would be our evening meal tips. Eleganza cafe in Ross on Wye do a lovely salad for lunch. The Blorenge walk in the Brecon beacons is stunning, the family cycle route in the forest of dean is a good all ability trail. The more adventurous in our party loved the blue trail. 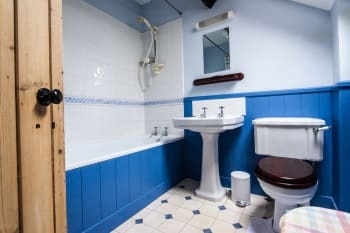 The cottage was in a really peaceful setting and well-supplied with essentials to make our stay at Watchmaker's Cottage comfortable and enjoyable. Jenny and Max were always friendly and made us feel welcome. We were especially impressed with the home-made cream tea set out for us on our arrival. Very friendly and welcoming, kind gesture from Jenny of cream tea and delicious plums on arrival. Obviously well loved cottage as well maintained, clean and cosy. Local pub Red Lion recommend for evening meal. Great location for mountain bike trails in the Forest of Dean, about 20 mins drive away. Well worth visit to see Ss Great Britain in Bristol, Tintern Abbey, Gloucester Cathedral and pretty village of Symonds Yat. There are good pubs and restaurants within a few minutes drive,and for activities I would recommend the wye dean tourist brochure. A beautiful well presented Cottage and grounds. The owners made us feel very welcome throughout our stay, with an added offer to freely use the surrounding gardens. 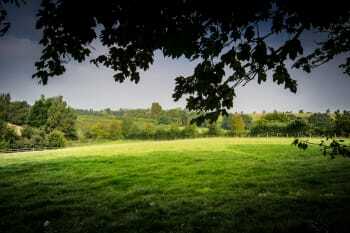 The nearby Forest of Dean area is well worth a few visits, with great varied walking trails. Symonds Yat rock, commands great views of the Wye valley. The nearby Red Lion pub is a great place for good food, and friendly service, all at reasonable cost. 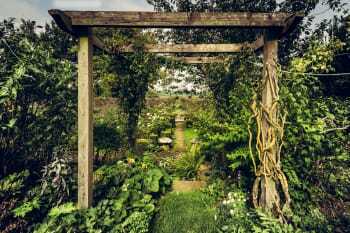 See the excellent (hidden) gardens nearby (1 hour) and the beautiful river Wye. Don't forget the Inn's Red Lion and especially Slough Pool in Sellack. GREAT BASE IN A VERY QUIET LOCATION. HAD ALL THE FACILITIES NEEDED FOR A GREAT WEEK! LOVELY SCONES WERE IN THE KITCHEN ON OUR ARRIVAL,MANY THANKS TO JENNY,THEY WERE DELICIOUS! WE HAD 3 GREAT MEALS AT THE RED LION,WINTERS CROSS, PETERSTOWE. WE DID NOT GO BACK TO THE COTTAGE HUNGRY!! IN ROSS,THERE IS A GREAT ITALIAN RESTAURANT CALLED AVELLINO,EXCELLENT FOOD,SERVICE AND WINE!! The main problem is the lack of heat in the premises during the day. When we stayed the weather was cool and a lack of internal heat was highlighted by ineffectual storage heaters. Great meal at the Red Lion in Peterstow. Lovely drive to Hay on Wye through the Golden Valley & Black Mountains. Jenny was there to welcome us. Tea cups and bara brith were laid out on the table. A very thoughtful and kind gesture. Every kitchen aid you wanted was supplied. We enjoyed the open fire in the living room. The bed was very comfortable and there were nice views from the bedroom windows. A dongle was provided, much appreciated, for our stay and we were offered maps and information on the area. Jenny and Max are unobtrusive hosts. They are there if you need them. 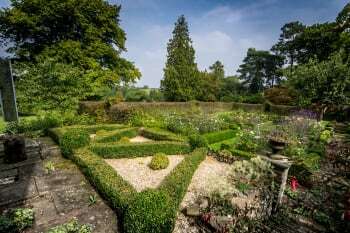 The location is convenient for Ross on Wye and Monmouth and popular walking destinations, such as Puzzlewood and Clearwood Caves. 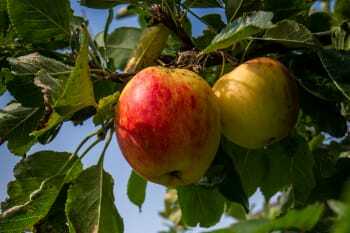 There are two local pubs including The Yew Tree which has a great atmosphere, to which is attached a shop selling local varieties of quality cider. Fabulous place, hosts were so friendly and helpful and nothing was too much trouble. We spent a month here after moving from Spain, whilst house hunting. It was the best holiday cottage we have ever stayed in and in fact although we are now in our new home, we were sad to leave watchmaker's cottage. Everything in the cottage was of the highest quality and obviously a lot of care has gone into furnishing and equipping it. We were even welcomed by our hosts with a lovely log fire lit ready for our first day. We would give it far more than 10 out of 10!! Book well in advance as it is so popular. Plenty of leaflets, maps etc for ideas of things to do, and the hosts live in the big house next door so you can ask them anything. They were nearly always available if we needed anything. Only advice would be stairs are a bit steep because it is a traditional old cottage, so not suitable if you have mobility issues. Also you definitely need a car as it is quite remote. But it is a lovely location to relax and beautiful countryside. Jenny and Max are fabulous hosts and super people. Extremely helpful and really made our stay a delight. Though the location is in the country you are only 5 mins from Ross, 15 mins to Monmouth and have 2 great pubs just minuets away. 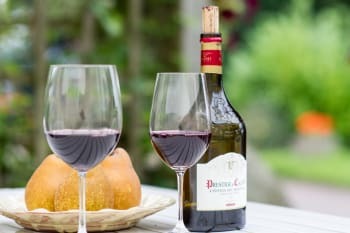 This part of the world is a real foodie area with many excellent restaurants, including Michelin*, fabulous butchers Cornwalls in Ross, plus good cheese shops. Then of course there are all castles and others historical spots! Harewood End Inn -copious quality pub food:-) Visit Taurus Crafts, Monmouth, Goodrich Castle, Hereford, Ross on Wye, Ledbury, if you have any free time after all this-put your feet up and enjoy ! All excellent - can be recommended. Lovely place, comfortable and clean, peaceful and quiet. Everything you need for a good holiday. Been in the area before so just generally enjoyed going at our own pace - slow. Like historical places and particularly enjoyed our visit to Chepstow. Over the years my wife and I have stayed at quite a few self catering cottages, many of which are adjoined to or on the grounds of the owners. However this is the first one that I’d really like to return to. The others were good but this one is great. Totally comfortable and totally relaxing. The owners are the friendly, accommodating and genuine sort that are so easy to get on with. The little extras like sending our son’s matchbox cars to us through the post when we thought we had lost them for good, speaks volumes. The deceptively spacious cottage is appropriately furnished and the kitchen includes everything you could need - even cookery books! The main bed is so nice it’s difficult to get out of. The baths deep enough to really enjoy a good soak and the gardens are beautiful to wander through. Ask Jenny and Max, the owners, for they know all of where to go and what to see. Mind you we didn't do too much adventuring as we enjoyed the cottage so much and it was Christmas.